A striking monkey totally black in colour, with its face framed by a prominent grey 'mane' and a tail ending in a tuft (very pronounced in adult males) from which it derives its common name. 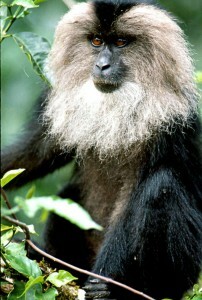 Like the Nilgiri langur (Trachypithecus entellus), the Lion-tailed macaque is endemic to the Western Ghats. 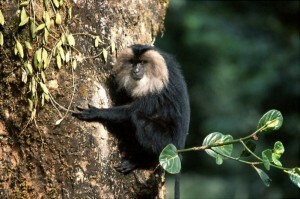 Unlike the Nilgiri langur however, the Lion-tailed macaque or LTM as it is generally referred to, has not flourished due to its specific food and habitat requirements. Exclusively a creature of wet evergreen forests, it is confined to elevations between 610 -1500m (2000 -5000 feet). Large areas of its habitat have been lost to tea, coffee & cardamom plantations and hydroelectric dams. This drastic reduction and fragmentation of its habitat coupled with poaching pressure has rendered the LTM the most endangered of all macaques. The largest single population is in the Kalakad-Mundanthurai Tiger Reserve, and may be around 300 animals. A highly specialised feeder, the LTM has a simple stomach akin to human beings, adapted to digest simple sugars and carbohydrates. These it derives from ripe fruits and seeds, and its protein from invertebrates such as insects, caterpillars, spiders, termites etc. Snails, bird eggs, nestlings, lizards are also taken. Dr. Ajith Kumar, an authority on the LTM sums up a typical day in the life of a lion-tailed macaque " Fruits, seeds and insects - the life of a lion-tailed macaque revolves around them". This adaptation or specialisation has however confined this monkey to the wet evergreen forest, where all these resources are available throughout the year. Langurs on the other hand are primarily leaf eaters and have a much more complicated stomach to break down cellulose and are thus more adaptable. The most arboreal of all macaques, the LTM lives most of its life in the topmost forest canopy, seldom descending to the ground even for water. Like other monkeys, it is gregarious and lives in troops which could vary in size from 10 to 40 animals though 15 animals is the average norm. Not a very vocal macaque, the troop none the less keep in constant contact while moving through the canopy with very soft low pitched 'cooing' calls. In the LTM females become adult at about 6 ½ years of age and males later at about 8 years of age. The menstrual cycle of the females is similar to that of human females. However, once the female conceives she will then not mate again for over 20 months. Females give birth only once in 3 years and there is no fixed season although more births take place during the south-west monsoon, which is a time of plenty, than at other times. A curious occurrence amongst the LTM's is the disruption of mating by other females especially if the female mating happens to be lower in the pecking order. Low birth rate, high age at first birth, high survival rate of pre-adults and adults appear to be evolutionary measures designed to maintain optimal stable populations in a stable habitat which is only now being subjected to fluctuations by intense human activity. Highly arboreal and dependant on the bio-diversity of the evergreen forest, the major threat to the LTM stems from the fragmentation of it's forests into parcels too small to support the 40 breeding animals that are considered the minimum number (deme) required to maintain a healthy gene pool. Even in areas under coffee and cardamom where canopies are maintained, the understorey is often denuded, climbers and other plants are stripped thus reducing the species richness of the area and human pressures lead to the lopping and thinning of the canopy. All factors inimical to the long-term health of the LTM. Roads and reservoirs also isolate and destroy habitat. Its is estimated that about 50% of LTM numbers are made up of sub-populations that are under threat of isolation. Hunting is also a serious threat which has increased with the continuing colonisation of the western ghats especially by people from Kerala. Computer simulation has shown that even the removal of two animals every year from a population of 50 can drive that population to extinction and the same number taken from a larger population will suppress densities. As in the case of all threatened species across the board conservation of habitat must be the number one priority. However, more layered and nuanced responses are also required to try and save many of the smaller sub-populations. Restoration of species richness in denuded areas, identification sand protection of corridors, enhanced protection against poaching and introduction of healthy animals into in-bred groups are all measures that need to be implemented to ensure survival of the LTM population. Karanth, K. Ullas 1985: Ecological status of the Lion-tailed macaque and its rainforest habitats in Karnataka, India - Primate Conserv. ; No. 6. p. 73-77.